The “Rock Out 4 Mental Health” flyer. Room for sponsor logos if you sign up in time! When Brandon Lillard, a founding board member of I Am Beacon, and best known by Beacon High School alums as the original “Mr. 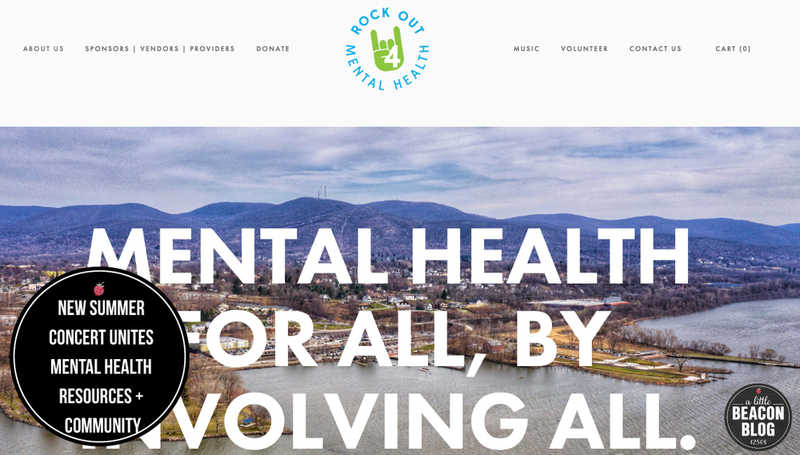 Beacon High,” asked me to be part of the planning of I Am Beacon’s second major awareness project for mental health, the ”Rock Out 4 Mental Health” Concert on June 1st, 2019 at Pete and Toshi Seeger Riverfront Park, I said yes immediately. As a mother of young children, I want to make sure they have a safe space to express their minds. As a new mother in general, I see and experience the mental health challenges that any parent faces. As a person living in Beacon, I have learned from my friends involved in mental health support about challenges that any person can face at any time. 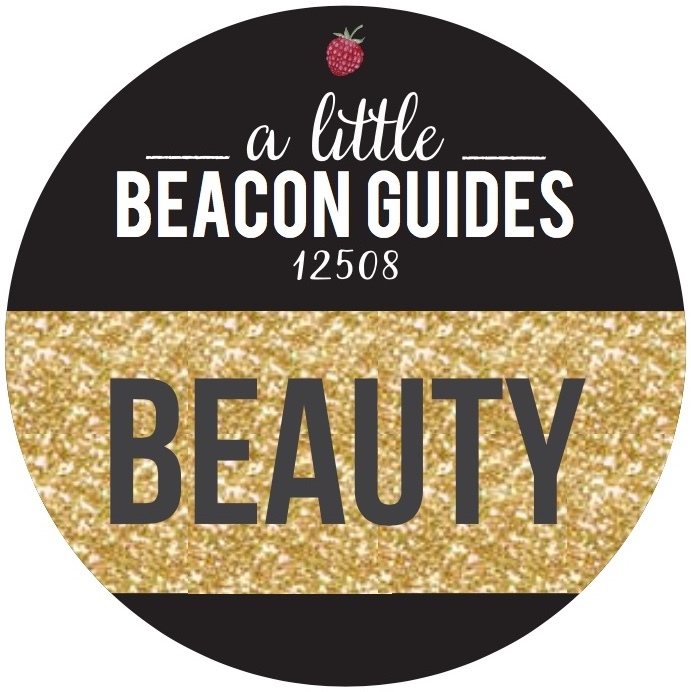 Removing the stigma about that is important to me, and as a blogger, improving awareness to it to make it easier to access is part of why I started A Little Beacon Blog - to get the word out about what is happening and available here. The planning for this event would be fast, but we could do it. I Am Beacon’s first outreach project for Mental Health awareness was and continues to be the yellow ribbons campaign on Main Street they do with NAMI (National Alliance on Mental Illness) Mid-Hudson. You’ll be seeing those ribbons again this year. 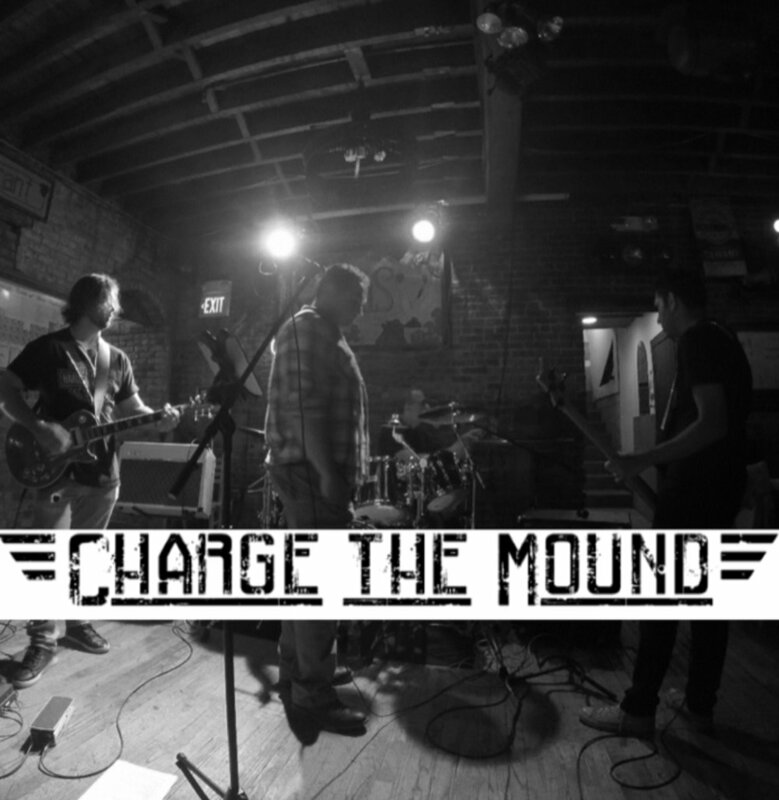 This concert was created as a vibrant and hopeful hub where people can get closer to organizations who provide a variety of mental health services. The aim is to bring these services to people who may not have otherwise known about them. Usually service events like this are at school functions on a random Wednesday night (I went to one!). 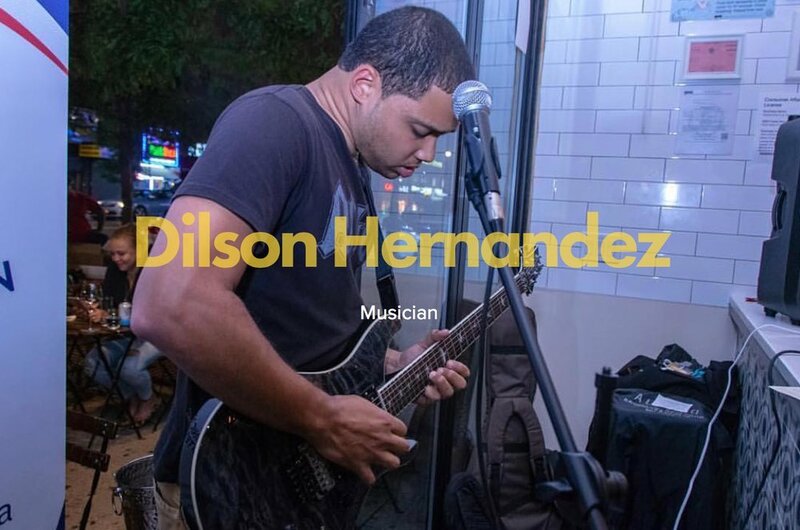 Now, the whole family can come and enjoy being by the Hudson River rocking out to music, and getting to know these local services who have changed the lives of so many. You’ll be rocking out to The Costellos, Noetic, Tony E., Dilson Hernandez, and Charge the Mound while your Co-MCs for the day, Rueben Simmons and Himali Pandya, Special Projects Manager for Astor Services for Children and Families, introduce you to the mental health resource providers who are available to meet during the day. Must sign up within the week for print deadline! Vendor Opportunities: Food vendors are welcome, and businesses who provide a wellness related product or service to people are invited to have a vendor spot down at Pete and Toshi Seeger Riverfront Park. Only 15-20 spots available. Food and business vendors can register here. Those organizations who are nonprofits can have a spot for free and can register here. 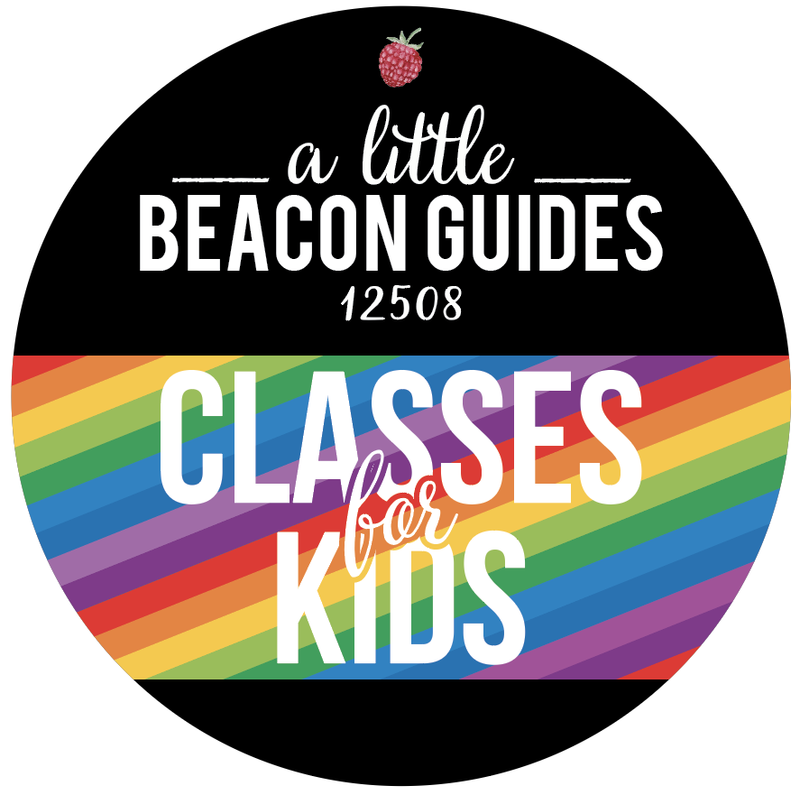 These community projects are what keep Beacon enriched with the depth of community it is known for, and keep Beacon an ongoing advocate for people’s well-beings. Thank you to the following sponsors and vendors who have signed on so far! Why This Concert? Why Now? One of the creators behind the event is Reuben Simmons, a founding board member of I Am Beacon, along with his sister, Brooke Simmons, and Brandon Lillard. Reuben grew up in Beacon, volunteering to clean up its streets in his youth, and co-created I Am Beacon to keep opportunities like this available to the people. This concert was created as a vibrant and hopeful hub where people can get closer to organizations who provide a variety of mental health services. The aim is to bring these services to people who may not have otherwise known about them. This way, you’ll be rocking out to The Costellos, Noetic, Tony E., Dilson Hernandez, and Charge the Mound while your Co-MCs for the day, Rueban Simmons and Himali Pandya, Special Projects Manager for Astor Services for Children and Families, whose husband is also performing with his band at the concert. “We hope to reach as many Dutchess County residents as possible to inform them about the many resources available for help and support. The Dutchess County Helpline and the Stabilization Center are available to residents 24 hours a day, 7 days a week. There is always someone available who can help,” says Jean-Marie Niebuhr, Prevention and Harm Reduction Coordinator. If you take anything away from this event, or knowing about this event, know about this: The Dutchess County Helpline. Available to anyone to use at any time, 24/7. Use it as an information center to find other resources: CALL or TEXT 845-485-9700. Call or text any time to talk live to a qualified mental health professional. Regardless of the issue, the HELPLINE will provide counseling or link you to services. From sitcoms and fashion to music and technology, the recent 2000s have not escaped the influence of the late 90s. It is hard to believe that the era that produced Joey Tribbiani is the same era that paved the way for today’s Opioid Crisis. In the late 1990s, pharmaceuticals convinced healthcare providers that prescription opioid pain relievers were not highly addictive. Healthcare providers prescribed opioids at a much faster rate before realizing the intense addictive nature these drugs possess. As of January 2019, the National Institute on Drug Abuse estimates the death of 130 Americans per day from the overdose of opioids. People suffering from chemical dependency are not the only ones affected; babies are bearing the burden as well. About every 15 minutes, a baby is born undergoing the agony of opioid withdrawal, commonly referred to as Neonatal Abstinence Syndrome. Aside from the staggering death rates and effects on child mortality, the economy bears a dent from the Opioid Epidemic. A total of $78.5 billion a year is drained by prescription opioid misuse as estimated by the Centers for Disease Control and Prevention. Estimations include the costs of healthcare, lost productivity, addiction treatment, and criminal justice involvement. 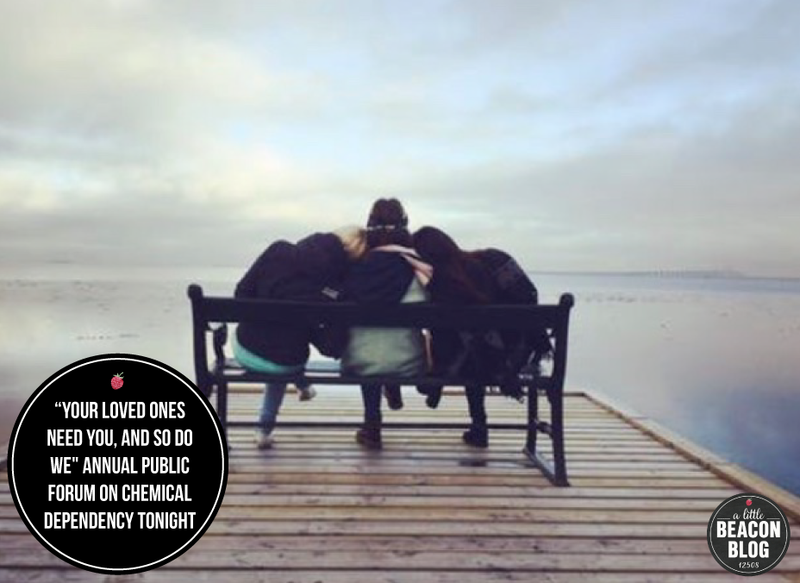 The Dutchess County Department of Behavioral and Community Health is holding a public forum on Thursday, April 11, 2019 for individuals and families dealing with chemical dependency. Discussion chips away at the barriers of stigma, and the more questions asked, the more answers heard. Representatives include Lexington Center for Recovery; Council on Addiction, Prevention, and Education (CAPE); Mid-Hudson Addiction Recovery Centers (MARC), Matt Herring Foundation and others. Kelly Ramsey, M.D., a renowned expert on substance use disorders and Medication Assisted Treatment, will be there as a guest speaker. The event will be held on April 11, 2019 from 5:30-7:30 pm at the DBCH Training Room (entrance #1) . At 5, a free narcan training will be held and refreshments will be provided. Narcan blocks the effects of an opioid overdose, a necessary skill to learn for those in the public health field or personally affected by chemical dependency. Representatives will inform the public on initiatives in effect and progress achieved in this field. An open discussion followed by an encouraged Q&A will be held in an effort to keep the community informed on this growing crisis. 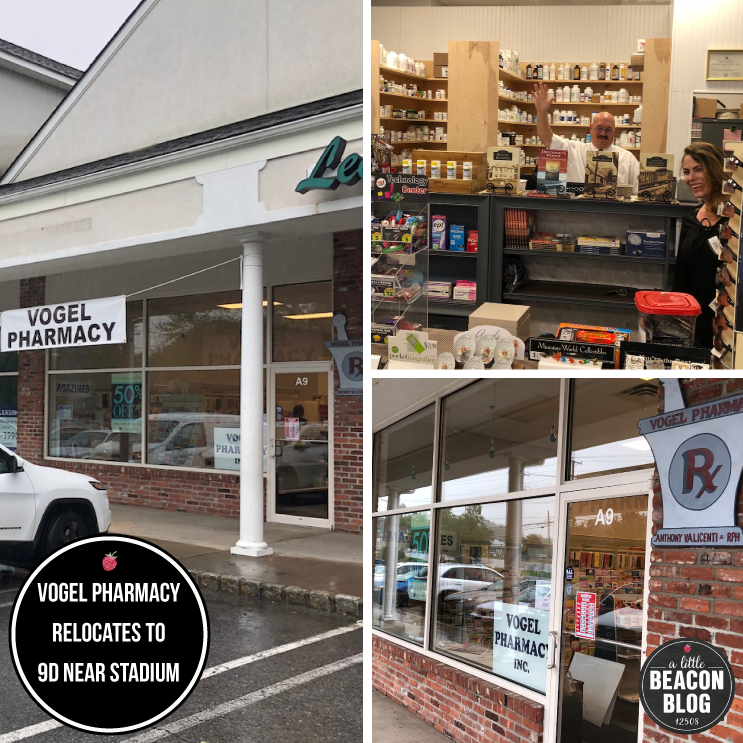 Vogel Pharmacy relocates to 1475 NY-9D, in between Leo’s and the Dollar General, after the building housing its longtime Beacon location was sold to new owners. 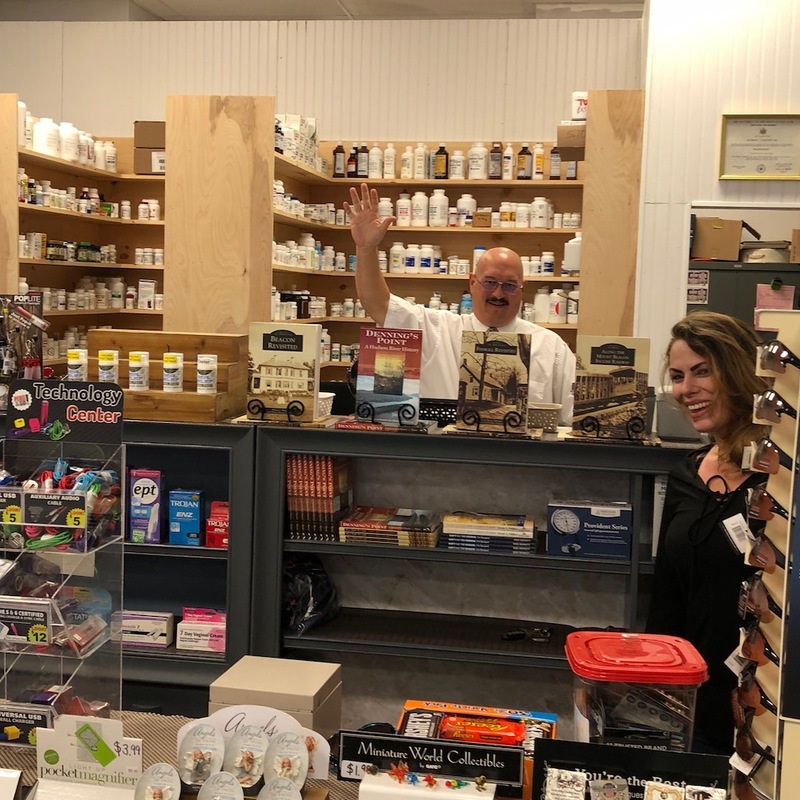 Pictured above is owner Anthony Valicenti waving from behind his new counter, and a staff member Audra. The former location of longtime Beacon business Vogel Pharmacy, on Main Street in Beacon, NY. Vogel has since moved 10 minutes away to the plaza across from Dutchess Stadium, 1475 NY-9D, now serving old and new customers. 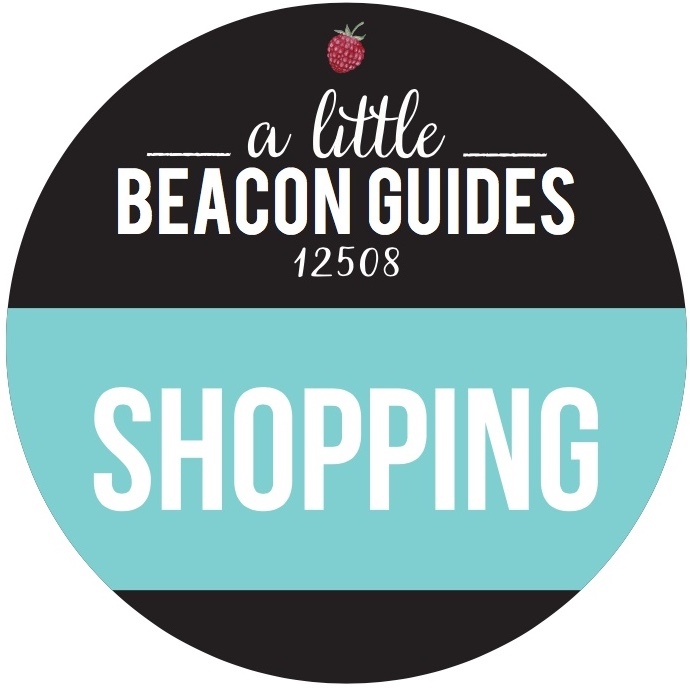 In what is quickly becoming a new series on this blog - perhaps we’ll call it something like “Where did that shop go?” - we’ve been following which Beacon shops are moving where. They are often swapping ends of Main Street, or moving slightly off of Main Street. We tracked down Vogel Pharmacy, owned by Anthony Valicent. 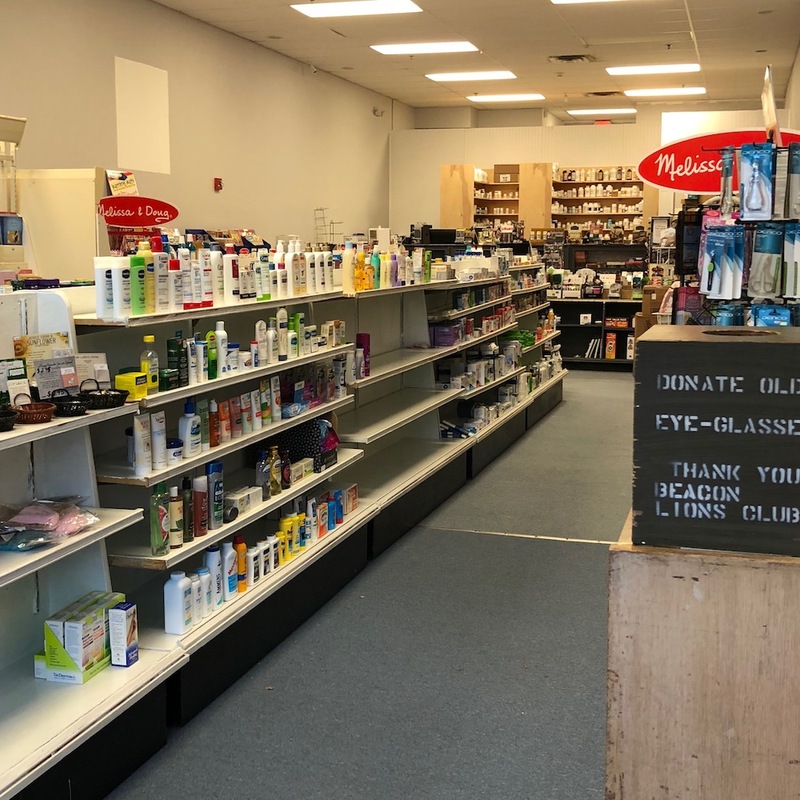 For months, the pharmacy was in the process of moving from its longtime location at 234 Main Street (in the middle of Main Street near Homespun) after the building containing the storefront space they leased was purchased by new owners. We are longtime customers of Vogel, preferring to get prescriptions filled with a local pharmacy that has deep roots in the community. Not to say we don’t high-five our friends who work at Rite Aid (love that nail polish bar and greeting card section … and remember that time Rite Aid got a total makeover and sliding front doors? ), but having a local pharmacy keeps it real. So Why Did Vogel Leave Downtown Beacon? 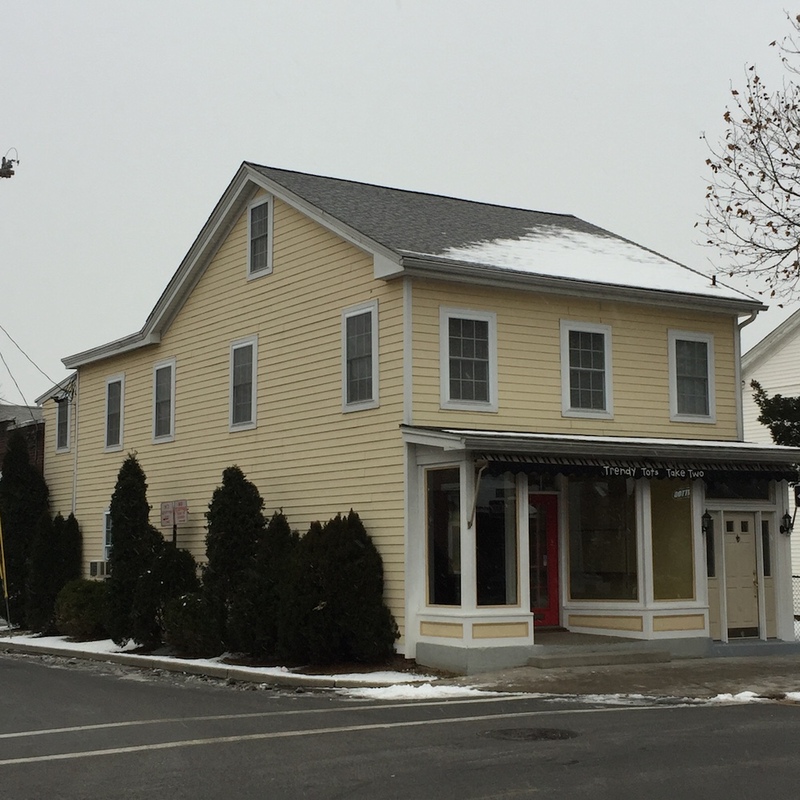 The building at 234 Main Street that housed Vogel Pharmacy was for sale earlier this year. Anthony told us that he considered buying it, but knew the building well, and knew it was in bad shape. When the building did sell to new owners, they had other plans for it that did not include it being occupied for the next bit. 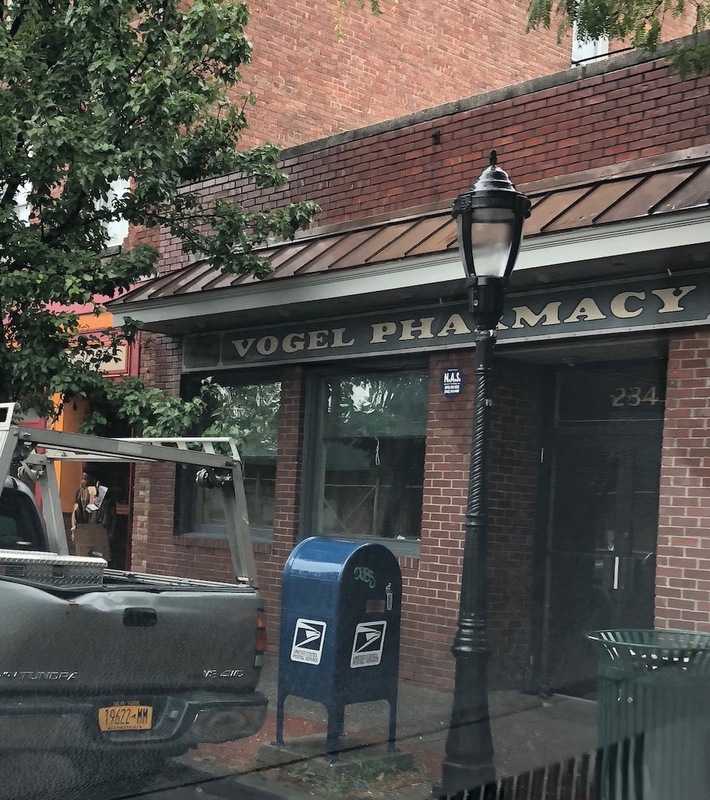 Vogel Pharmacy had been in downtown Beacon for decades. Vogel was one of our “Where Is This?” contest locations when we featured their vintage wall with the original beaker wallpaper. Anthony had worked for Vogel when he was an up and coming pharmacist, and for last 16 years has owned Vogel Pharmacy himself. The New Vogel - Is The Same! With Gobs More Parking! If you call after hours and don’t hear a voice mail, don’t worry. Simply call during their Open hours. Silver linings are everywhere in this relocation story. For starters, the parking. Vogel serves everyone including the elderly, veterans, kids, and irregular cold and flu patients. The downtown Beacon Main Street location did not have much parking, and walking there has become even more difficult, now that the building is dwarfed by scaffolding to the right of it, and directly across the street, as two multistory buildings are built from the ground up. Homespun has had to put up a sidewalk sign at the end of the block encouraging people to keep walking through the scaffolding to find them. Now when you drive to Vogel in their new location, you have sooooo much parking. You need a disabled spot? You got it! Is Leo’s busy that night? Is there a sale on detergent at the Dollar General? No problem! There is parking in the back of Vogel or on the other side of the VIP front row parking spots. Already, new customers who live in the area are coming in, thankful for the new pharmacy. Inside of Vogel, the aisles are just as they were, and the phone number is the same. Don’t worry, all of your old favorites at Vogel are still there. Even Vogel’s phone number is the same. The Melissa & Doug toys (that are so often marked down) that you can buy your kids when they come with you to pick up a prescription. The eye-glasses donation box. The magazines. Vogel is where I get my monthly issues of Family Circle and Better Homes & Gardens, conveniently placed right next to the cash register, under the Blow Pops. Anthony waves from his new perch while filling prescriptions. Anthony himself is there as usual at the end of the aisles, either filling prescriptions or on the phone. The famous Rx sign hangs outside on Vogel’s new brick wall, just as it did at the other location. I don’t mind driving down 9D. I look forward to it when I visit Stony Kill Farm, and I even drive my car payment to Rhinebeck Bank’s Beacon Branch - by choice. Vogel isn’t the only Beacon business I’ve followed after they relocated. I followed my hair dresser Josh Boos to Newburgh from the Green Room (the salon near the mountain across from The Roundhouse). His new digs are in The Atlas Building in Newburgh so that he can manufacture his hair color organizer invention. So cool over there! I’ll be one of the voices encouraging the Newburgh/Beacon Ferry to ramp up its schedule, because it’s going to need to with all of this spread. Look for Vogel at the Spirit of Beacon Day! Vogel got a table this year at the Spirit of Beacon Day, so go say hi! This is the first year the Spirit of Beacon folks considered allowing businesses to have vendor tables (traditionally, only nonprofit organizations had tables). Regardless, Vogel’s move is so big, they probably would have been approved for a table anyway. Congratulations to Anthony and his staff for making the move and making it through uncomfortable times in a business transition. The new location really does come with perks, and I’ll enjoy filling my family’s prescriptions there. During the first whammies of the flu season, A Little Beacon Blog blogged about our own flu symptom prevention tea by sharing this recipe for our Sickness Miracle Tea. Nutritionists, however, are on the case all of the time in sharing their recipes, food tips and cleanses. 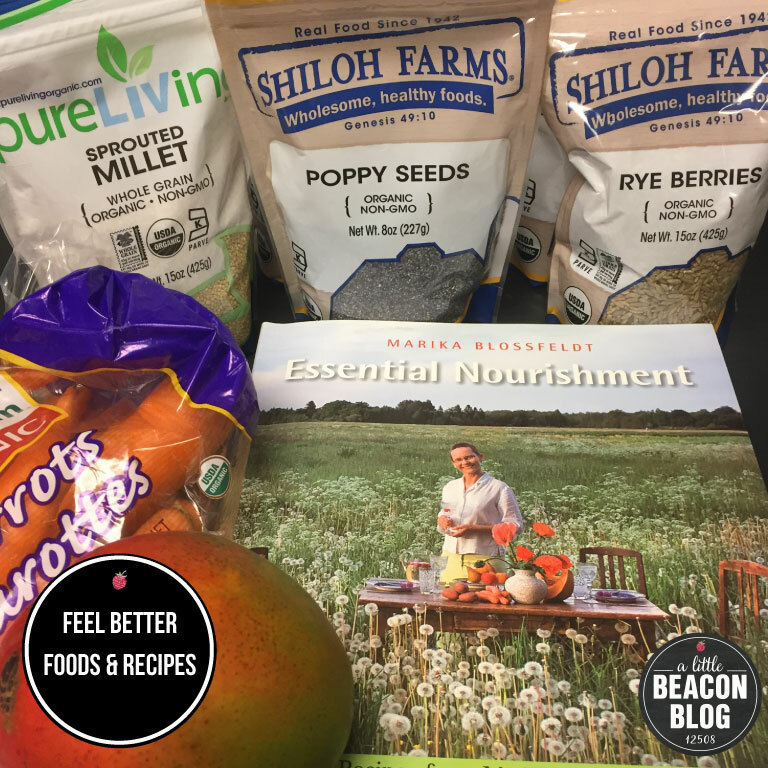 When a flu prevention email from Beacon local Marika Blossfeldt showed up in our inbox, bearing several healthful recipes, we earmarked it and couldn't resist sharing them with you. Of course, medicine can save lives, and food is not a replacement for medicine that can be prescribed by a doctor. Nutritious food simply builds the foundation for a strong body that can yield positive results, but you should always work with your doctor when addressing problems with your body. Please see your doctor right away if you have any symptoms of the flu, especially respiratory issues. One day, Marika was holding a cooking class in the Chocolate Studio (thanks A Little Beacon Blog's Classes for Adults Guide!). It was at that class that Marika's book finally came home with me, and several promises to read and cook from it have been made ever since. Not gonna answer whether those promises have been fulfilled yet, but the picture for this article illustrates recent healthy purchases from Beacon Natural Market. We're committed to making one of Marika's porridges! It's Spring now, and we're still hearing reports of people being knocked out for a week with the flu. Bonus! Allergy season has now arrived, and take it from this allergy sufferer - a bad case of an allergy can turn into a pretty bad cold. We're not out of the woods yet with the flu, so read Marika's remedies below in her own words. And do yourself a favor - just print this out and tape it to the fridge. To keep your immune system humming and strong, make sure you drink enough water and get plenty of rest. It is OK to sleep more in the winter – in fact, it is the smart thing to do. Our bodies crave it. So allow yourself to indulge in beauty sleep without any guilty feelings at all. Many common spices have antimicrobial, antiviral and expectorant powers. Use ground spices in your food and make tea from ginger and turmeric root, as well as cinnamon sticks. Boil them for 10 to 20 minutes, and sip on your brew often. Lacto-fermented vegetables are higher in vitamins than their unfermented counterparts, and boost immunity by providing live probiotic bacteria. Have 2 tablespoons daily. You can find unpasteurized sauerkraut and pickles in the cold section of your natural food stores. They are easy to make yourself. My recipe for Peppery Sauerkraut follows below. Use these powerful ingredients in food and drink. Make salad dressings using raw garlic, lemon juice, olive oil and honey. Add lemon juice to your drinking water. Use honey instead of sugar. To keep honey’s medicinal power intact, never heat it over 95 degrees F (or 35 C). This is a powerful concoction - take 1 teaspoon every day first thing in the morning on an empty stomach as a preventative. When already under the weather, take 1 tablespoon three times per day, one before each meal. This is strong stuff and meant for adults only. It is not suitable for children. Press the garlic into a jar, add all spices and lemon juice and stir. Add the honey and mix. Let the mixture sit at room temperature for three hours, then transfer into the refrigerator. At the first hint of a cold coming on, take a dropperful in a glass of water and drink 3 times per day between meals. You can find echinacea tincture at your health food store. Eat vitamin C rich foods such as black currants, red and green bell peppers, kiwi, broccoli, kale and parsley. Eat leafy greens on a daily basis. Besides being powerhouses for vitamins and minerals, they help reduce mucus and clear congestion, especially in the lungs. Their chlorophyll content supports the good gut bacteria, thus boosting immunity. You can sauté them with garlic or have them in a smoothie. Milk products are mucus-producing foods. Time: Doors will open at 6:30 pm and the training will begin at 7 pm. In light of the recent shooting events and the early morning fire at Rombout Avenue, parents are looking for ways to be more prepared in an emergency situation. The Dutchess Country Department of Emergency Response and Beacon Mayor Randy Casale are inviting all parents to the Citizens' Preparedness Training, Tuesday, April 17, at Beacon's Fire Station #2 located at 13 South Avenue. Doors will open at 6:30 pm and the training will begin at 7 pm. William H. (Bill) Beale, the Emergency Management Coordinator for the Dutchess County Department of Emergency Response, says: “Through our countywide community preparedness assessment, we discovered the need for citizens' preparedness training. As a result, we can fund it through federal training." At this training, participants will get a Starter Kit that includes FEMA-recommended items. "This kit and the ability to add to it is very important," says Bill. According to Bill, “We’re seeing more flooding than we’ve seen previously.” Flooding is the No. 1 natural hazard that affects Dutchess County. "If you’re in a low-lying area, be aware that it could happen. Many people live in rural parts of Dutchess County," further from life-saving first responders. Attendees will be trained in what to do during sustained power outages. Days after we moved to Beacon from New York City several Januarys ago, Beacon experienced a severe blizzard where we lost power for three days. Being city-folk, we didn't know what do to. However, if that had to happen, I think I'd rather be out here in a small-town city than up high in an apartment building! "During the last Nor’easters," Bill explains, "many people were without power for nine days. This program trains in how to be prepared for sustained power outages." Among the goals of the evening training session will be making people aware of what types of disasters can affect Duchess County in case they need to evacuate the area or shelter in place. Situations that will be covered include severe thunderstorms, tornadoes, winter storms, public health emergencies, hazards materials (chemical and biological threats). Available each day to those who are really into being prepared is the Mountain Scout Survival School, with its headquarters on Main Street. Several classes are available through the Mountain Scout Survival School, including firemaking skills, knife-handling skills, winter skills, and other survival skills for living outdoors. This training does not include what to do in active shooter situations. 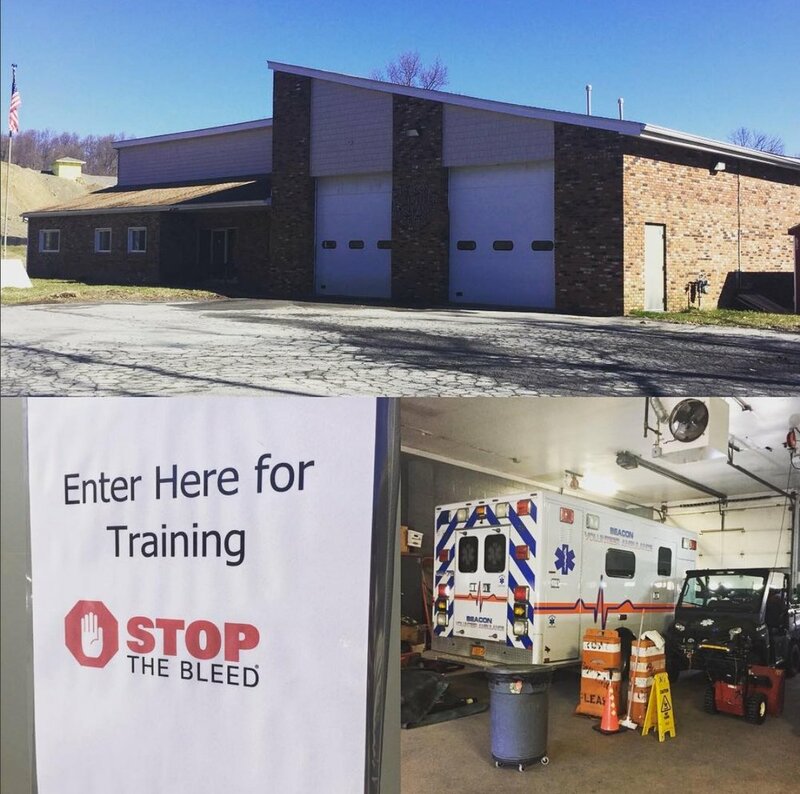 "Stop the Bleed does address that," says Bill, referencing the training program that is readily accessed through the Beacon Volunteer Ambulance Corps, who can bring their Stop the Bleed training to you if you organize a group. Tuesday's event is free and open to the public. You can get more information by visiting www.dutchessny.gov or calling (845) 486-2080. The Beacon Volunteer Ambulance Corps will be participating in National Stop The Bleed Day on Saturday, March 31, 2018. The Stop The Bleed Program is designed to teach the general public how to control severe bleeding. The Beacon Volunteer Ambulance Corps will be holding a series of one-hour classes throughout the day beginning at 9 am. Training will be at their headquarters located at One Arquilla Drive, Beacon, NY. If you would like to attend one of these valuable training sessions, please call (845) 831-4540, then at the prompt, choose option 5 and leave a message. 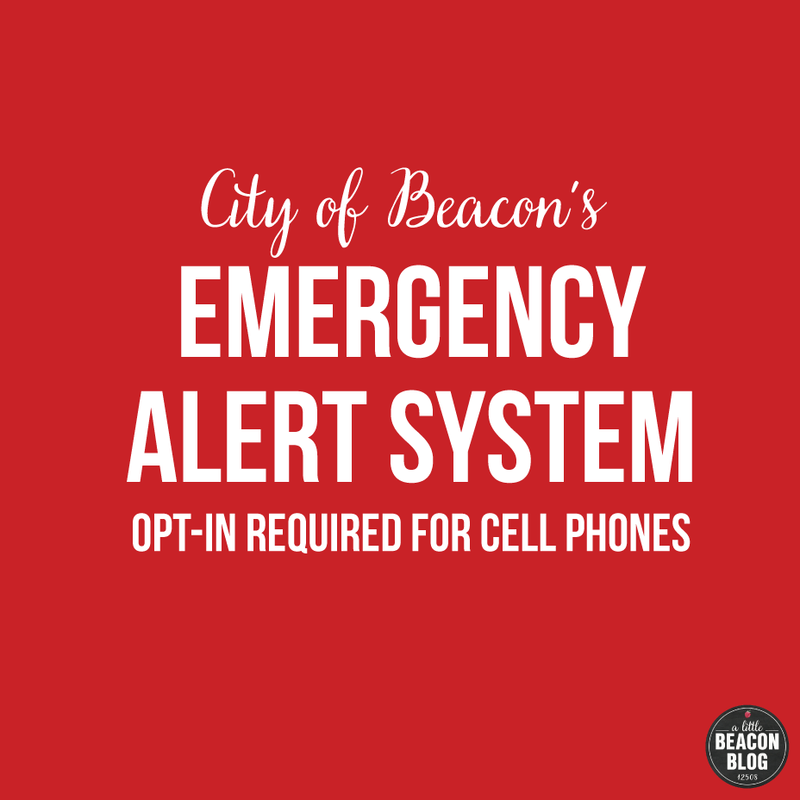 One of Beacon Volunteer Ambulance Corps' instructors will call you back. You can also send a message to stopthebleed@beaconvac.org and they will get back to you. Instructors who train in how to stop bleeding are available at any time to provide this training to your club, scouting group, organization or to your employees. Please contact them using one of the above methods if you are interested in training for your group. There is no charge for this training. You might have an old bottle of apple cider vinegar in your cupboard, but do yourself a favor and pitch it. If it’s old, it most likely looks unappealing to you and you’ll skip this recipe. Take yourself to the olive oil store, Scarborough Fare Olive Oil and Vinegar Tap Room, on Main Street, next to the building construction and across the street from Homespun Foods. There you will find a deliciously refined bottle of apple cider vinegar that you’ll actually want to drink. Next, cross the street to Homespun and select local honey, or the “Super Special” honey from France. Those who go deep with nutrition may prefer the local honey to get more local flower pollen into your body, but if you’re partial to pretty cans and French flowers, try the Super Special honey! That’s what they call it at Homespun, so just ask for it by name. I just bought it for the first time, and I’m an allergy barometer, so I’ll let you know if the foreign flowers make me sneeze. Probably not. Then, shred a bit of that ginger into the mug with a knife or a cheese grater. Slice up the lemon and squeeze into the concoction. My favorite sick-day mug is one that I picked up at Wickham Studio’s pop-up Holiday Sale three years ago, as it always fits just the right amount of this tea. Finally, smell the tea for a while. The aromas will start working immediately on blasting out the unpleasant feelings. Bonus round! For achy bodies, get thee to a bath right away, and soak in Epsom salts. If you go the route of unscented and un-anythinged, you’ll have only the magnesium sulfate to draw out the toxins from your body and relax muscles. Epsom salt baths are a frequent Mom-recommended thing, and an Internet-recommended thing. Vogel Pharmacy, right next to Homespun, is the place to buy straight up Epsom salts. Your total cure and sickness miracle tea, all in a three-shop radius. Well, save for the ginger and lemon, which are just down the block at Key Food. Trendy Tots Take Two, the kids consignment store in the sweet corner yellow house, has closed. Owned by a husband and wife team, this store had been a resource for parents who consigned gently used kids' stuff, and bought low-priced, high-quality items. Owner Jenn had a discerning eye for threads and did not accept everything that was brought into the store. Toward the end of summer 2017, the store posted a sign that said it would be closed until September. Small business owners often make personal choices like this - basing Open Hours around family needs. One time, Jenn was in a car accident and hurt her hip. Another time, the couple were caring for an aging parent and their open hours became inconsistent, but later returned to normal. But September came and went, and the shop never reopened. In fact, the building and the grassy lot next to it, as well as the warehouse behind that which was known to be rented by artists from time to time, were put on the market to be sold. Asking price was $1 million. According to the realtor, there has been an offer on the property. The merchandise inside of the store has been removed, and we were unable to reach the owners to see if Trendy Tots is relocating. Just in the nick of time, a local mom, Jenny Donovan, opened Wee Bitty Kids, LLC, near Artisan Wine Shop on the west end of town near Bank Square Coffee. This has replaced the vintage shop Classic Couture Fashion Boutique. The owner of Classic Couture, Leah, has said she will send us an update when she finds the next location for her collection of vintage fashions. In the meantime, Jenny is taking new consigners and has new and gently used clothing and items for sale. You can learn more about the store via Classic Couture's website and Facebook page. Note: The new shop, Wee Bitty Kids, has no connection to the volunteer-based nonprofit group, the Wee Play Project, who runs the annual Ree-Play Sale fundraiser every April to raise money for Beacon's parks and library projects. Longtime oils concoction artist, Leah Quinn, maintained a storefront at this corner store. Inside, she carried anything you might need to solve most any ailment. If it wasn't there, Leah would tell you how to make it. Over the summer of 2017, Leah packed it in at the storefront and went digital all the way. 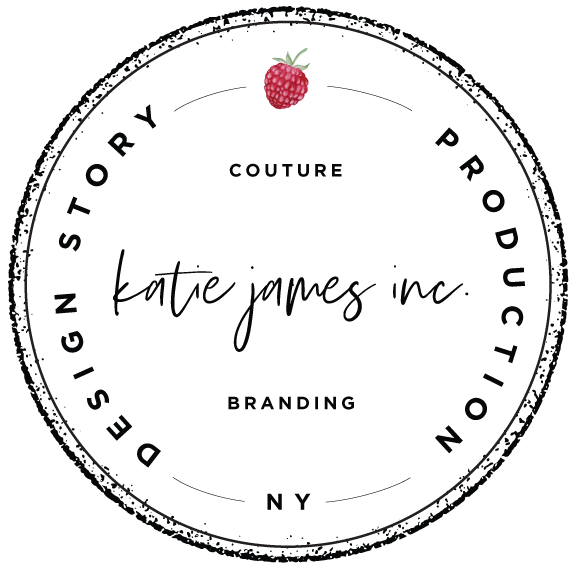 She seems to be exploding from her website, offering Subscription Boxes, workshops, and what looks to be a new line of clothing, like this hoodie. Don't worry, you can still get Leah's Wonder Salve online here! It truly is wonderful, especially for eczema and sufferers of super chapped lips. Waejong Kim was born in Korea. She moved to Japan for college and after graduating from Tokyo University of Foreign Studies she worked as an interpreter and later opened a Korean fusion restaurant in Nagoya, Japan. She moved to New York after 9/11 and worked for a corporate housing company. She taught herself how to crochet, took a long vacation, and never returned to the corporate world. Waejong has a German shepherd named Loopy and and orange cat named Mango. Anna Pulvermakher was born in Russia. She moved to Seattle, WA, with her family and after graduating from the University of Washington with a degree in Mathematics, she worked for Microsoft and Expedia as a Software Test Engineer. In 2003, she moved to New York to pursue her dream of becoming a professional artist. 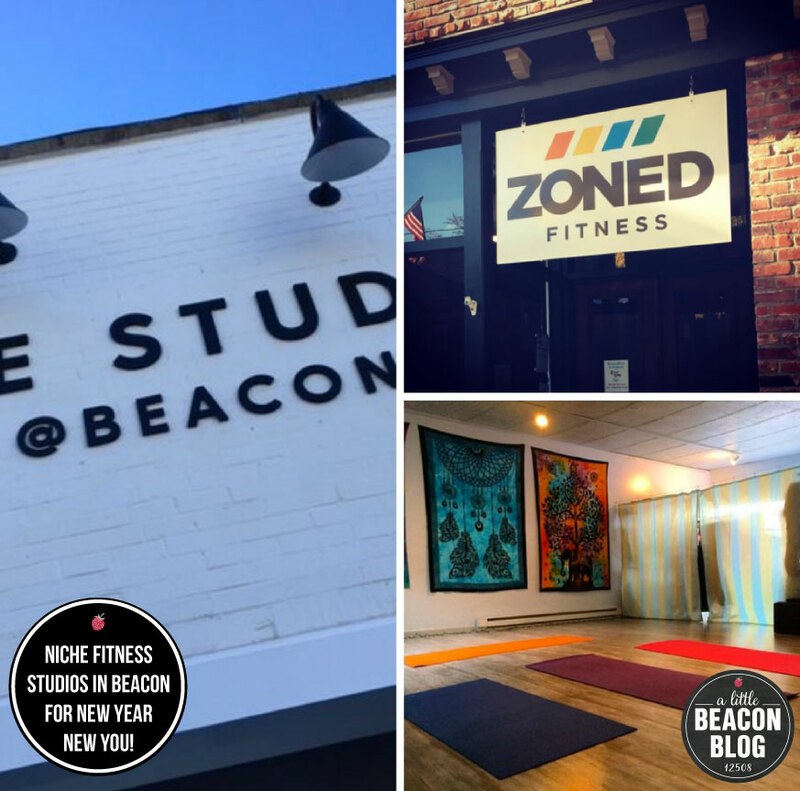 Hudson Valley Fitness has rebranded to Zoned Fitness, and boy are they in the zone. 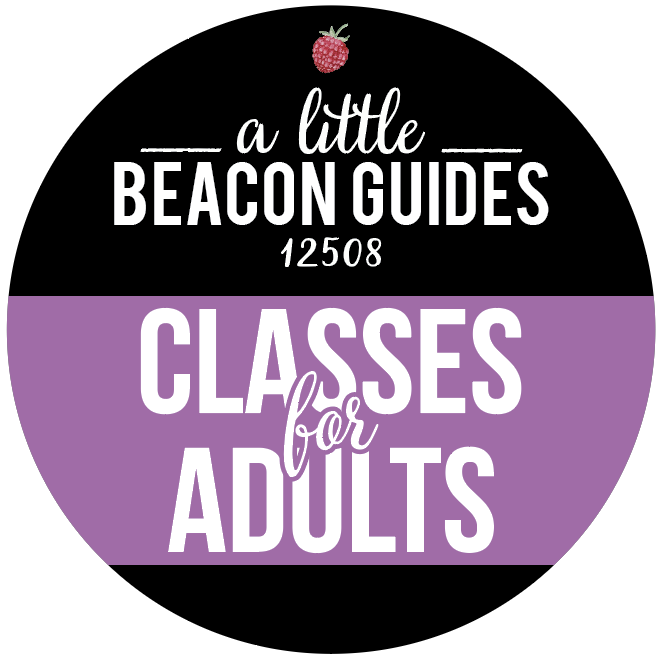 We've watched their website for a number of years as we looked up information for A Little Beacon Blog's Adult Classes Guide, and the latest updates demonstrate that they are clearly in the zone, and are ready to transform your body. Their services Include food and nutrition training as well. 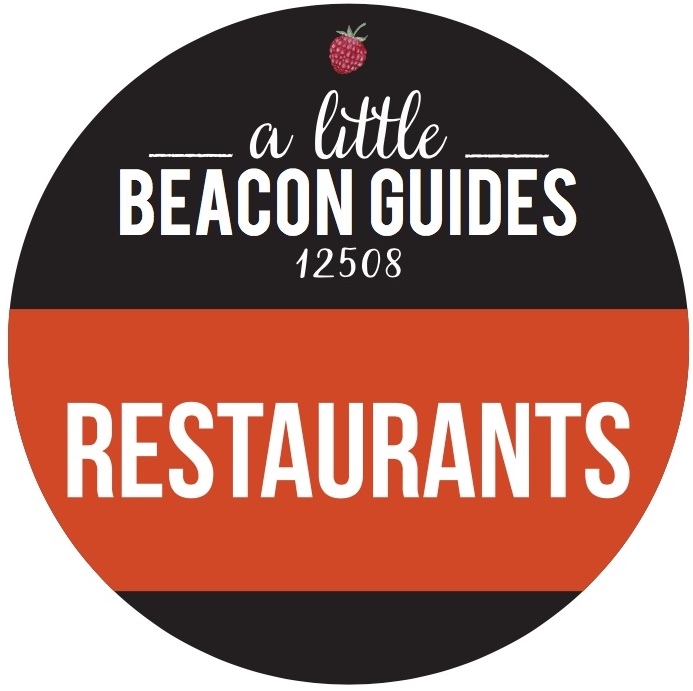 Branding done by Beacon locals Rabe & Co. If group classes and exercising in a community is your thing, then All Sport is for you, especially right now! The activity levels of All Sport's members vary, so All Sport has made available almost every kind of class you could want - from the upcoming Heart Chakra Yoga Class, to the popular Class Mashups which involve two different teachers and specialties, to the upcoming Small Group Training Trifecta Event with DJ Mace as a live DJ! Plus, don't miss the free Country Line Dancing class to prepare you for the upcoming six-week line dancing program. Then, escape to All Sport's relaxing sauna to warm your bones and/or calm your mind. A Little Beacon Blog keeps a Guide of not-to-miss classes and events at All Sport, so check it out to stay on top of what's going on over there! All Sport's Event page lineup on Facebook is also a good place to check if you want to hook into posted events. The healthy food options at All Sport's Fuel Cafe have gone to a new level, and it's thanks in part to Beacon's own Chef Megan Lawrence (you know her from Nixie Sparrow days), who has brought creative soup, salad and other meal options to the snack counter at All Sport (see the Fuel Cafe's Instagram to be tempted). The most recent announcement has been the new Food Composting Program that Fuel Cafe is starting with Zero To Go, another Beacon-based organization. All food scraps, cups and containers will be placed into a compost bin and taken to a facility where they will soon turn into soil for future crops. Full circle! 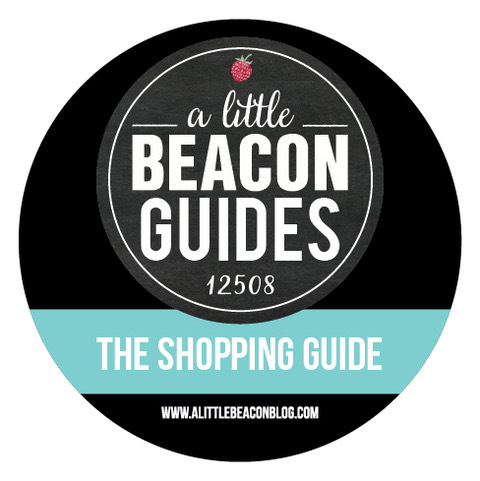 All Sport is a proud sponsor of Little Beacon Blog, and it is through support of businesses like theirs, this publication is able to promote news and events you want to know about. This article has been part of All Sport's Sponsor Spotlight campaign with A Little Beacon Blog. It may be cold outside, but All Sport will keep you sweating all winter long! And we're not just talking about their sauna, although they have that too and it's one of our favorites. Today is the first day of Member Appreciation Week, from December 12 to 15, and All Sport is showing its members a little extra love with events for adults and kids, including a mini Wellness Workshop and photos with Santa! See dates below and more information here. There are so many ways to enjoy All Sport, we maintain an All Sport Guide here at A Little Beacon Blog. At the beginning of every month, we throw the spotlight on the dates you don't want to miss. In honor of the holiday season, All Sport is hosting a variety of musicians in the lobby throughout the month to get you in the spirit. Don’t miss a serenade from members of our own Beacon High School Orchestra on Wednesday, December 14 from 5:30 to 7:30 pm! 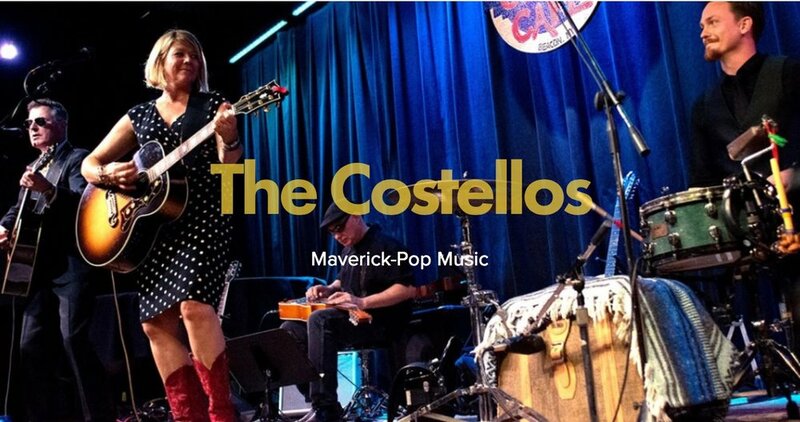 And the Costellos will also be playing during All Sport's Member Appreciation Party on December 15. If you're used to the band lineup around the pool during the summer at All Sport, then you won't be disappointed at this social schedule. Plus, Santa is coming during the Kids Craft Party on Tuesday, December 13! You could occupy the kids for the entire week of Winter Break, or you could treat them to a day (or three) of All Sport Camp in the Winter. From 8 am to 5 pm on weekdays from December 23 to January 2, your children ages 5 to 12 can spend their days swimming, playing sports and games, doing arts and crafts, and more. Holiday Camp is available for members and non-members, but members get a daily discount. See more details here, and call the Front Desk at 845-896-5678 to register. Registration for Winter I kids activities, from fencing and gymnastics to swimming, opens on December 14 for members and two days later for non-members. The phone lines light up for Swimming Class registration, and others. 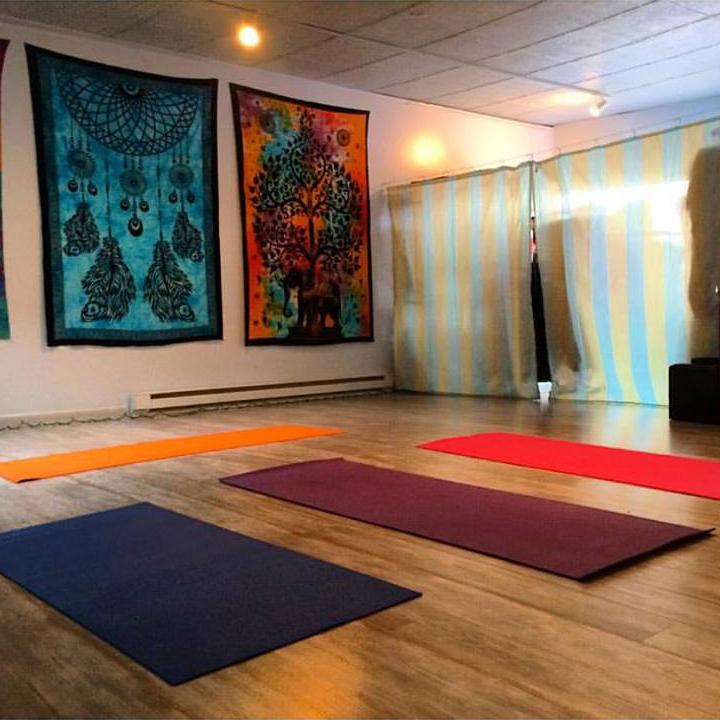 See our breakdown of all kids classes, and find out how to make a workout for you happen at the same time as a sports class for your child. The next Small Group Training Transformation Challenge starts on January 9, just in time to get through the holiday leftovers and start working on your New Year’s resolutions! The program runs through April 4 and includes unlimited small group training sessions, progress tracking, nutrition seminars, and more. Even better: The Transformation Challenge is only $299 for members. There is a lot more going on at All Sport, so see our All Sport Guide for special classes, themed classes, and much more. Editorial Note: All Sport is a Sponsor Spotlight of A Little Beacon Blog, and this post has been a part of our Branded Content Partner Program. Thank you for supporting businesses who support us! Major work has been going on in the center of Main Street at The Beacon Veterinary Associates, the new vet in the same strip as More Good, Towne Crier and Oak Vino. Six months ago, Dr. Nicholas Spaccarelli (aka Dr. Nick) bought Roosevelt Vet on the Hudson and has been enhancing it ever since, working with the existing staff and veterinarians like Dr. Bethany Souers, and preparing for their major name change. Celebrating this Saturday at their Open House from 12 to 4 pm, you're invited to stop into their hospital and office location at 345 Main St., where they will personally take you on tours of the facility. You'll recognize several faces of the team if you visited prior, including Morgan, Dr. Souers, Nicole, and Heather. Soon you can meet Mike McCabe, LVT (Licensed Veterinary Technician) who sees patients during select Saturdays. Dr. Nick Spaccarelli was born and raised in the Hudson Valley. He went to SUNY Delhi where he received a degree as a veterinary technician. He later attended Purdue University and continued on to Ross University School of Veterinary Medicine. In 2007, Dr. Spaccarelli returned to the Hudson Valley to begin working in private practice and to pursue his professional interests in surgery, rehabilitation and pain management in pets that have chronic issues. A few years later in 2011, he went back to Ross University as a faculty member and clinician at the Veterinary Teaching Hospital. After three years on the island of St. Kitts, Dr. Spaccarelli returned to the Hudson Valley to fulfill his lifelong dream of practice ownership. He brings over 10 years of small animal experience to the Beacon Veterinary Associates. He is excited to be adding orthopedic surgery and chronic pain management to a long list of advanced offerings at the practice. Dr. Spaccarelli resides in Hopewell Junction with his wife Megan and their newborn daughter Mackenzie. They have a dog named Marshall that they rescued, along with two red-footed tortoises - named Harry and Sally - from St Kitts. He is an avid traveler and has been to Europe, Australia, Canada, the Caribbean and Central America. His passions include surfing, stand-up paddle boarding, fishing, hiking, cooking and spending time with family and friends. This article has been a Partner Post with Beacon Veterinary Associates as a Spotlight Sponsor. Thank you for supporting businesses who support this publication and the community!